First select your fabrics for the little squares. Please pay attention that if you are using directional fabrics or are doing any fussy cutting, you are cutting them on point (diagonally) because of the positioning of the finished block. Press the rows. I press my seams open. Sometimes I press to one side on bigger pieces, but I've noticed with smaller pieces, pressing seams open helps with accurracy and reduces bulk. Lay out your pressed rows again. See how they are laying neat and flat? Sew together each row until block is complete. Press. To trim your block, line up edges so that you are a little more than 1/4" away from your little points. That way you won't sew through them when you construct your quilt. Using a see-through ruler helps to do this. Trim all 4 sides...please read all instructions below before trimming your block so you have a clear understanding of how to do this first. While trimming, use mat and ruler guidlines to keep block square. The measurement doesn't have to be exactly 7.5". Find the measurement that works for your block and as long as all of them measure the same, it'll be fine. Mine aren't exactly 7.5"...they are a little bigger, I just followed the same marking on my ruler. If I was simply following a measurement of 7.5", I might end up cutting too close to some of the points and I don't want to do that. Just be aware of that 1/4" marking on your ruler to make sure you won't be sewing through any points. Bottom line, it doesn't really matter what the measurement of the final block is as long as they are all the same and you're not cutting within a 1/4" of the block points. I hope that isn't confusing, but I think once you are making your block you will understand this. So simple! In my quilt I used 12 blocks. If you wanted a smaller project, you could use just the one block for a pillow or make 4 blocks for a larger pillow or a wall hanging. For making the quilt, I have given some very general measurements to follow and also my fabric choices. I didn't give detailed instructions for each step of constructing the quilt. It's more of a guideline to get you headed in the right direction. All of the fabrics used in this quilt are from my new line, The Simple Life. Here are some measurements for sashings and borders. Sashing is what goes in between and around the blocks. 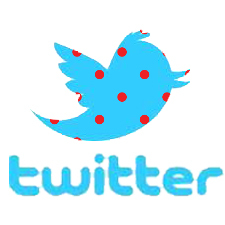 I chose the pink/red polka dot on the white background. Then I have 2 borders....the red polka dot and the pink floral. For the binding I used the aqua gingham. This quilt measures about 48.75" X 40.5"
This quilt really goes together quickly! If you have done a little piecing or patchwork, this is perfect for you. It's a pretty small quilt...baby sized. If you want it bigger, just make more blocks or wider sashings and borders. I hope you love making this quilt! It's my favorite right now! I loved this one I saw on Pinterest, by Sewn With Grace and it was really fun and easy to put together. It's constructed the same as a Granny Square, simply with less sqaures. So if you've done granny's, you'll think this is super fast. I really love fussy cutting for centers! I really don't know if there is a tutorial for this block, so I'd be happy to put one together if you are interested. Let me know! I may end up doing some general cutting instructions for this quilt anyway, just in case. Next week? I'm crossing my own fingers for you and ME that everyone will stop coughing around here first though. Hmm...Maybe begging will work better? It's been a little rough since I've been home from market, but I think I'm finally feeling back to normal. Even though the market experience can be tiring (and just plain wipe you out for days), it's definitly worth it! Not only was it exciting to have my own fabrics on display, it was also fun to see everyone else's displays and to meet such amazing and friendly people. I can't say enough about how nice everyone was. I didn't meet anyone who wasn't supportive, encouraging, kind and friendly! Meeting Joel Dewberry was a definite highlight for me! He was so down to earth and genuinely kind and personable. We chatted with him for a little bit and I learned that his mom is Donna Dewberry of One Stroke Painting who I used to watch (in awe!) on TV when I was a teen. My sister is a true hoarder of Joel's fabric, so it was fun for both of us to meet him. I loved the cute outfits he had in his booth! Meeting Allison from Cluck.Cluck.Sew was great too! I've been following her blog for a couple years and I love her patterns and style. She's super nice and totally laid back! Speaking of super nice, we loved chatting with Chelsey from Pink Fig patterns. She was there helping Lila Tueller with her gorgeous Mistique booth and they were both so helpful and encouraging to my sister, Talia, who is just starting to look into the pattern business. I had a picture of us with Lila as well, but it turned out blurry. I got this one of the two of them at takedown, I know they were exhausted, but I thought the photo was cute. They really were so fun to meet! Just so nice! It was fun to run into Sherri from A Quilting Life right in front of my booth. I've also been following her blog for a while now too and she is one talented quilter! She even bought some of my Spoonflower fabric a while back, which was partly the beginning of my fabric adventure. Thanks Sherri! ;) She was also very sweet! Loved this adorable booth from Darlene Zimmerman! So sweet! The awesome dresden at the Liberty booth! I spotted some quilts from Bonnie and Camille's Marmalade! Lovely, lovely! Pretty quilt from the Mary Rose Collection...so cute! Fascinating quilt made of super teensy squares!! The best part was meeting everyone from Riley Blake! I loved watching the booth in action. They are the kindest people and they work so hard to get everything done! They are amazing people to be around! So, I think that's enough pictures for one day, don't you?!?! I say yes. I have to tell you who I missed though! Somehow, even though we planned on meeting, I missed my sweet and spazzy friend Kristyne from Pretty By Hand! HOW, oh how did that happen, we both say??? We ran into everyone else but each other! Next time!! AND....how on EARTH did I miss the fact that TY PENNINGTON people! was at market and I didn't KNOW! I was even telling my sister how he has fabric now and that we could actually meet him someday and it still didn't occur to me to investigate if he was in acutality, AT MARKET! Helloooo?!?! Truth is...I'm a little spacey like that. No lie. If I forgot something or someone, please forgive me. I had a lot of photos, but some were no good....blurry or really bad face making or something. I loved meeting everyone though!!! I met the super sweet and talented Pam Kitty Morning and my favorite little girl skirt designer, Jona (who has tons of market photos!) ...but the pictures just didn't turn out. :( both were the just the sweetest, nicest people though!! I know, it's about time already! I've been in some serious recovery mode since I got home and I'm not sure I'm done yet either. With Halloween and now a few sickies in the house...me being one of them, I barely have my things out of my suitcases! For reals. So please forgive me....once again...for my super slow behavior. And in advance, I apologize for some bad photos too. Sadly, the Iphone didn't measure up quite like I had hoped. Next market I'll have to haul the real camera! I was soooo super glad to have my mom and sister come along with me to market! I couldn't have done it all without them. From setting up, to figuring out how to get to where we needed to go, to just having the moral support, friendship and someone to chat with....we had a great time! I grew up watching my mom sew practically everything...dresses, clothing, dolls, pillows, home accessories and yes, lots of quilts and blankets! I loved learning new little things from her along the way. Cross-stitching, making little dolls, stuffing handmade ornaments, doing lots of crafts. So truly I am so thankful she could be with me! My sister, Talia, is such a talented sewist herself! She creates and sews pretty much anything and everything as well! She always makes her own patterns for clothing (and other things too) for her darling little girls, so I was thrilled that she was willing to create a couple of outfits for my display, which will be available in pattern form for purchase soon! Kerri's quilt and a Marie Madeline dress! Amy's Patchwork basket and hexie pincushion! Talia's overalls. Pattern will be called 'Seraphina'. Talia's dress, Pattern will be called 'Amelie'. I'll keep you posted on availability for both. One highlight of my market experience was discovering that an adorable booth, Marie Madeline Studio, had used The Simple Life combined with Lecien's Flower Sugar to make their clothing! The company, Marie Madeline, is a mother and her 4 daughters. Just 3 of the sisters were there at market, but they are simply the sweetest and cutest girls you'll ever meet! I was thrilled to see my fabrics used in such adorable creations. Their booth won an award at market too! Thanks Marie Madeline!! Also, I wanted to thank Kerri (lovely little handmades), Amy (nana Company), and Heather (Vintage Grey) for making up some super cute things that helped make my display complete! I couldn't have squeezed in time for even one more teensy-tiny item, I was stitching on the plane!, so truly, I'm so grateful they were all so excited to help. It ended up just exactly perfect! Some of my pictures didn't turn out very well and didn't get used, so I hope to do some more photos of each of the items from my booth when I get a chance. I'm sure they will each do some of their own too when they get their cute things back, so keep an eye on their blogs. Check back later this week (hopefully, if I've fully recouperated!) and I'll post more of what I saw and who I met (and who I missed...waaaa!) at quilt market!